My mind is brimming with ideas this morning, laying down snapshots and processing happy memories of a glorious, flower-filled garden visit. 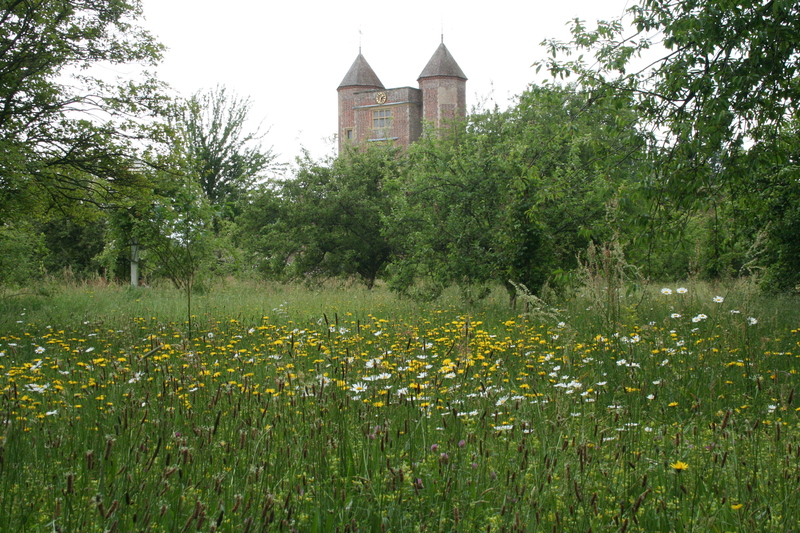 We first visited Sissinghurst in the early 2000s before our daughter was born. With two energetic toddlers in tow, we were more focused on keeping them on the paths and not straying too far from the toilets than admiring the glorious gardens and surroundings. I had clocked that it was a place of beauty, though, and we have some very lovely photos of the boys in the meadow. Despite now living only an hour’s drive away, it wasn’t until yesterday that we finally made the time to go there again, this time without any children – none of them could be persuaded to tear themselves away from their computing devices (oh yes, revision). ‘It’s ok, mum, you go on your own. We’ll be fine…’ ‘Well, ok then. If you’re sure.’ And we hotfooted it out of the door. How times change. Anyway, back to Sissinghurst Castle Garden. The place has a fascinating history: it was used as a prison for 3000 French soldiers captured during the Seven Years War (1756–63); it was a poor-house in the late 1700s; and it was a fine example of Victorian farming during the mid-1800s when it was owned by the Cornwallis family. Poet and writer Vita Sackville-West and her husband Harold Nicholson bought it in the early 1930s and set about transforming the buildings and grounds, creating the famous garden rooms that draw people from across the globe today. The National Trust took over managing the site in the 1960s, although members of the Sackville-West/Nicholson family still occasionally stay in the South Cottage. History lesson over (if you’d like to know more, start here), let’s move on. View to the north over the shop in the old piggery and restaurant in the granary (top left of photo). To the south, over one of the garden rooms with the propagation area (no access, sadly) to the right behind the house and the lovely curved wall. To the north-east-ish and the famous White Garden. The silvery tree you can see mid-left is a magnificent Pyrus salicifolia ‘Pendula’ (weeping silver pear). South Cottage and a snippet of meadow bottom left. 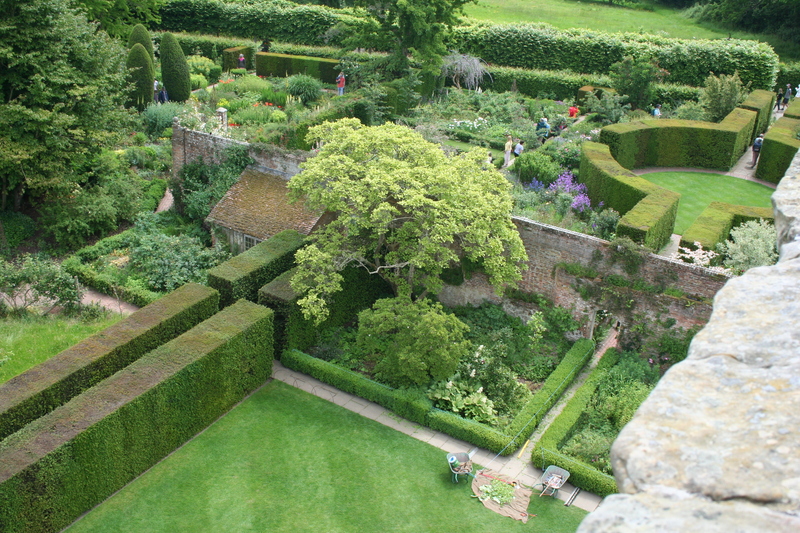 Gardeners (all women, as far as I could tell) were clipping box hedging; you can just see the wheelbarrows, etc, in the bottom of the pic. It was all very carefully done with lines and spirit levels (which is not how I do it!). 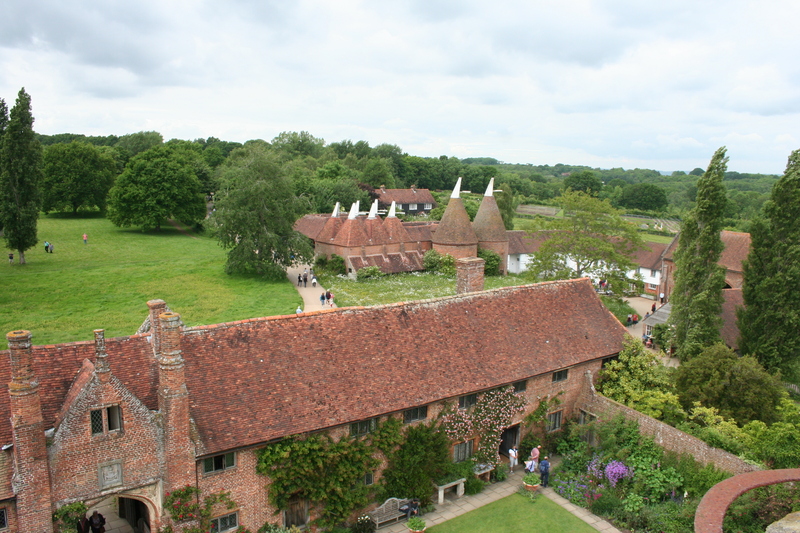 The library in the foreground and the oast houses in the background. The red brick buildings and garden walls provide the perfect backdrop to the swoon-inducing planting. Really, the planting is delicious. 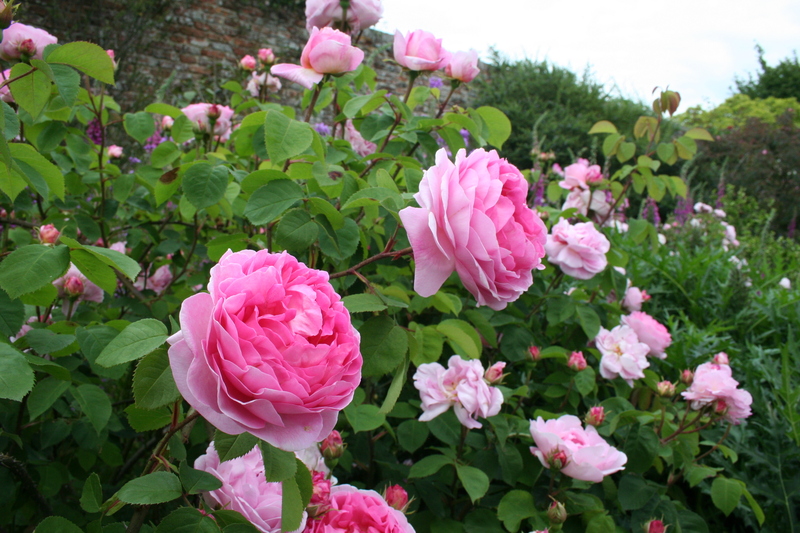 Roses, such gloriously scented roses – climbers trained perfectly against walls, bush roses left to grow huge, climbers growing up inside frames and over hoops, low-growing roses; the air was thick with their heady, intoxicating smell. 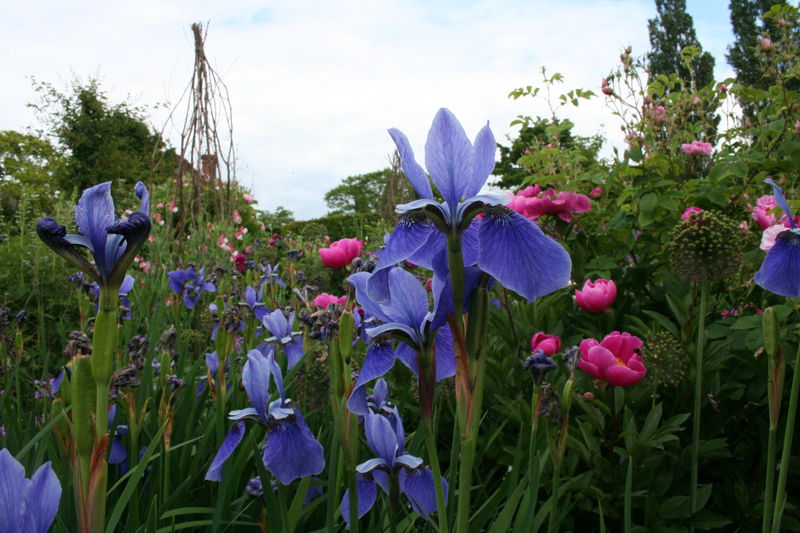 And the irises and salvias, and magnificent euphorbias of all kinds, all at their peak. 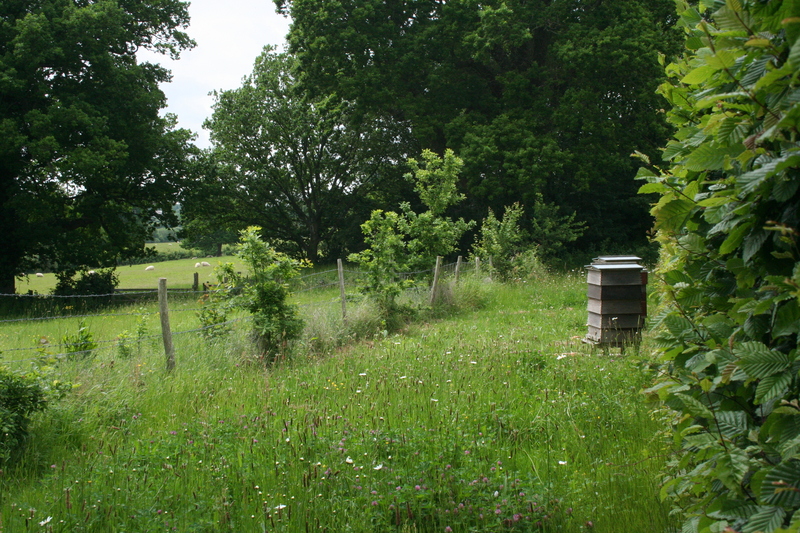 The grounds were full of wildflowers – oxeye daisies, tall buttercups, huge clovers, mixed grasses, all nodding and swaying in the breeze. The place is magical. Right, enough of that; must get on. Back to earth. Bye for now. How wonderful to be able to get a birds eye view. It all looks beautiful. Thank you for sharing ths, Sam. It’s far too long since I last visited – I don’t recall the romantic wild flower meadows but such a romantic complement to the historical buildings. I think the wildflower meadow is a recent change. It works beautifully. 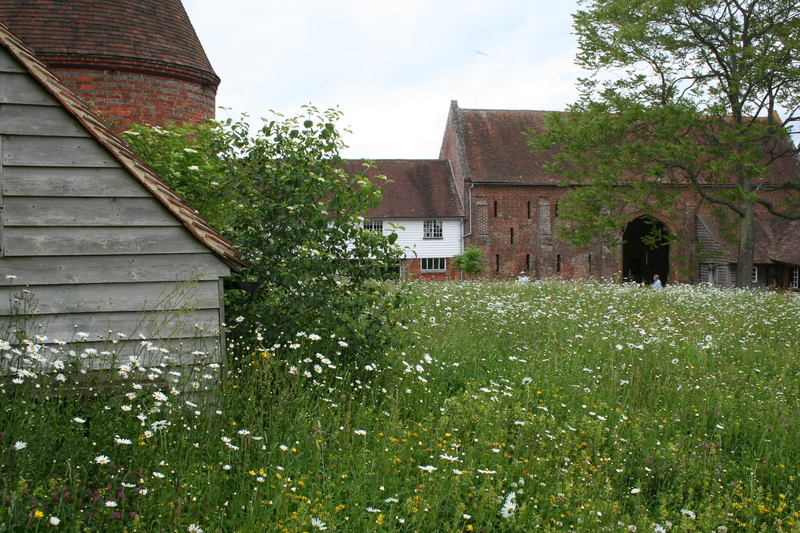 Sissinghurst does have a particular magical quality – I visited regularly when I was younger, and no garden since has ever quite matched up! I can completely understand that – it is rather special. All that history and beauty–it’s almost overwhelming. It does take your breath away. How lucky you are to live so close to those gardens! Beautiful pictures! What a lovely story – thank you for sharing. I think Harold’s and Vita’s spirits live on in the garden. I completely understand the mixed feelings (I, too, went to boarding school and have similar feelings about the two albums that we listened to in the car on the journey – Fleetwood Mac’s Rumours and Supertramp’s Breakfast in America!). My thoughts often turn to Sissinghurst at this time of year so it was especially nice to see this collection of pictures. I wish it was a little closer to my house. Ages since we’ve visited too. It will be interesting to hear which ideas you make use of. I remember particularly loving the Nut Walk. The Nut Walk was looking lovely. Thank you for this, Sam. 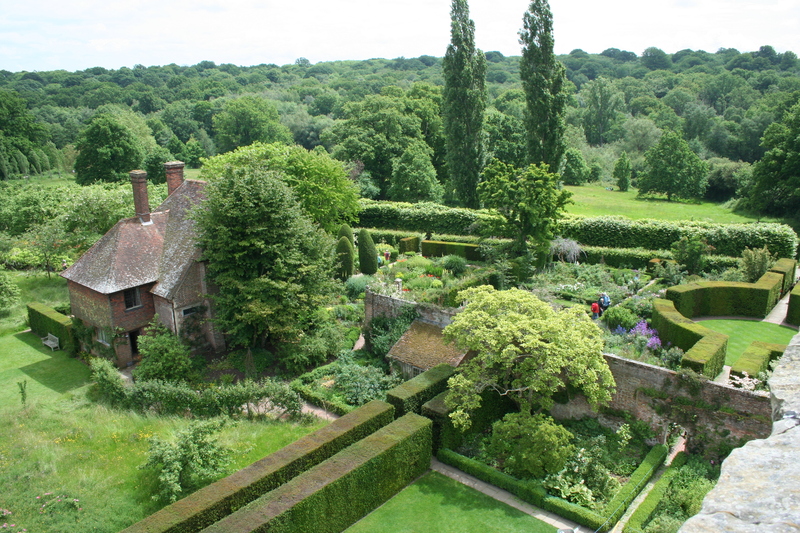 Sissinghurst is on my list of ‘Things To Do On Our Grand Tour Of England’ but that Grand Tour will take six months given the length of my list. This really is my idea of a dream garden, exactly the atmosphere and planting style I most admire. Honestly, my pulse is racing at the gorgeousness of it! It’s one of those places, Lynda. Maybe you could break down the Grand Tour into areas and start with Kent?! Oh how fabulous Sam! Thanks for your photos and evocative description of your day. I can almost smell those roses. 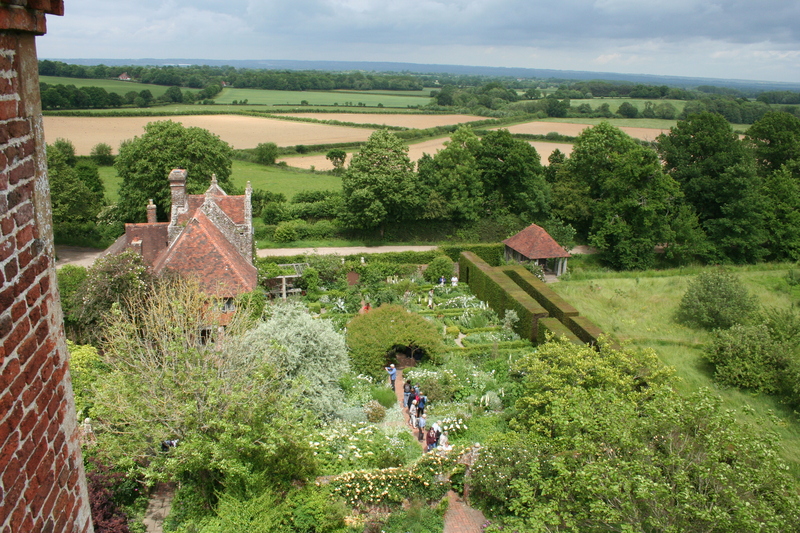 I got to Sissinghurst last July after 30 years of wanting to visit and almost burst with excitement on the day. It more than lived up to all my expectations. We visited Great Dixter too during the same week. Two such different gardens but both so utterly wonderful. 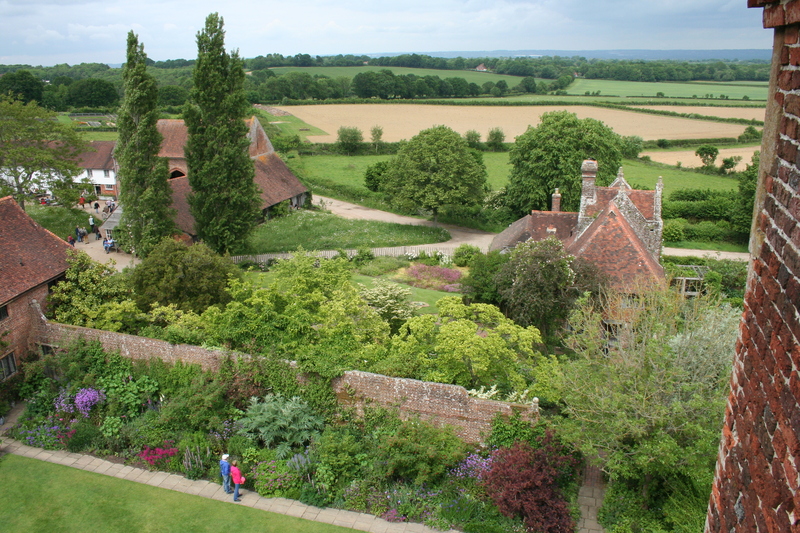 Great Dixter is fabulous, too, but different, as you say. They’re two of my favourite gardens. I think going the day after a Bank Holiday Monday meant it was quieter, and we were there not long after it opened. I don’t remember a huge wisteria but I was slightly dazed by the overall beauty of the place! The wisteria must have been somewhere else then – we had a blitz on Sussex and Kent gardens over a long w/e a few years ago! 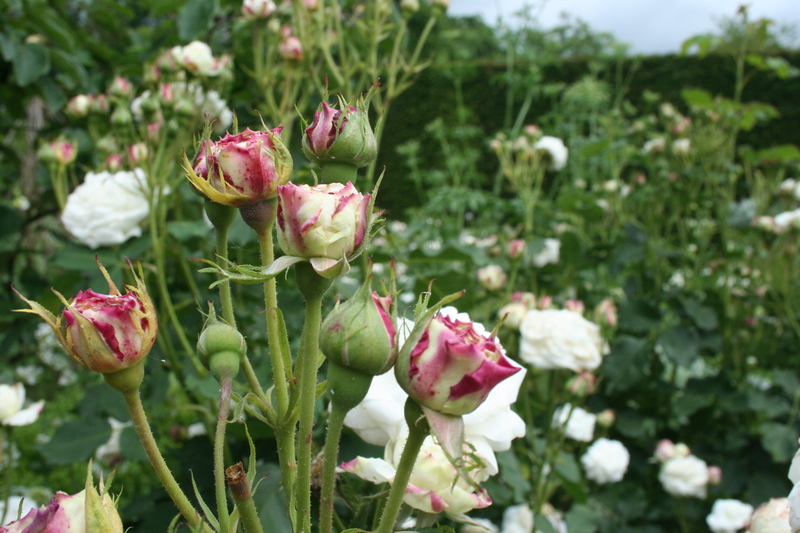 They do all roll into one after a while… Although Sissinghurst and Great Dixter stand out. 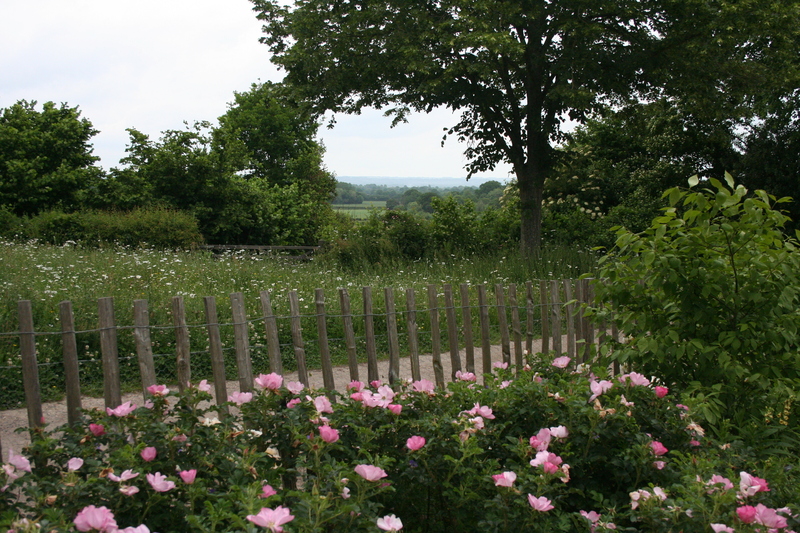 We visited several years ago along with Great Dixter, both wonderful. I understand the new head gardener is sourcing and planting more roses from Vita’s time. What a perfect time of year to go. My only visit was September. Nice too, but the exuberance of May takes some beating. We were lucky to visit on such a perfect day. To my eye Sissinghurst gets better and better. I have visited lots over the last three years (it makes an ideal courtesy stop for me en route to Canterbury and hip hip hooray my first class daughter is continuing with a Masters so more visits to come!) ) but since Troy took over as Head Gardener the romance is back and the whaleboning is disappearing, soft paths are replacing stone and views are being opened up to the beautiful Kentish landscape. Best of all some of the immaculate chemically improved lawns are being returned to meadow grass. I was last there a couple of weeks ago and it made my heart burst to see the latest changes,. 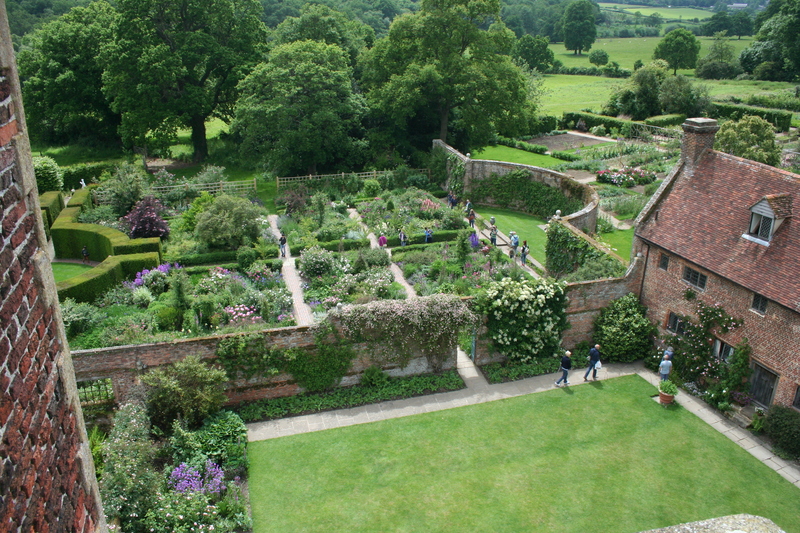 BTW the propogating garden is open on certain days, probably listed on the website, and have you read Adam Nicolson’s excellent book about the history of Sissinghurst? Congratulations to your daughter! How brilliant. I haven’t read the book but I will look out for it, thanks for the tip. 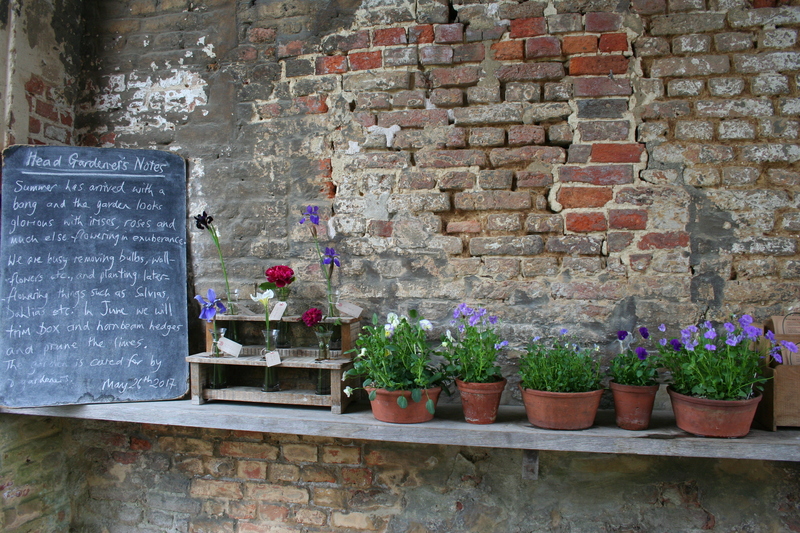 I wholeheartedly approve of the changes taking place at Sissinghurst! I’m so glad we got to visit Sissinghurst in late summer a couple of years ago. I love the pictures taken from the tower. I would really like to visit a second time in May or June. I hope you get to visit again some time.